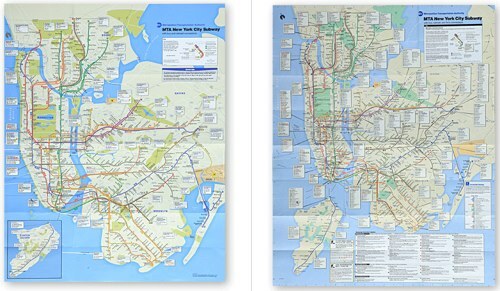 New York's new map (left) will start circulating in June, replacing the current version (right). Photo via The New York Times. New York’s Metropolitan Transportation Authority is set to release a revamped subway map – the first since 1998. The new map features a taller and fatter Manhattan and a shrunken Staten Island; brighter, cheerier colors; and pared-down bus-connection bubbles. The “service guide” along the bottom of the 1998 map has also been scrapped in favor of expanding the other three boroughs. 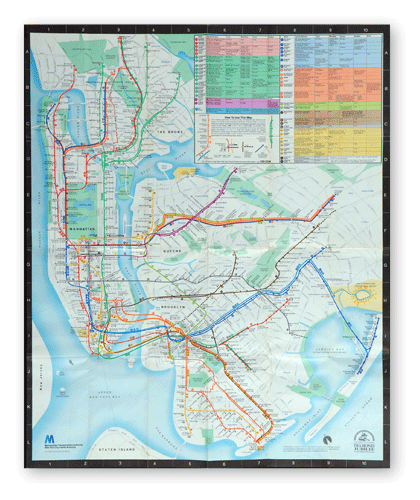 The new map is a descendant of the 1979 version, which was meant to be more geographically accurate after Massimo Vignelli’s 1972 design – featuring gray parks, brown rivers, and angular subway lines. The old version reportedly left riders a bit confused about what they would see upon re-emerging from their underground journeys. An eloquent defense of the love-it-or-loath-it 1972 map can be found here. The new map also erases all traces of the V and W lines, which were terminated as a result of MTA budget cuts. The M line will now run north on Avenue of the Americas, replacing the V and changing colors, from brown to orange. To account for these changes, the New York City Transit Authority is scrambling to replace signage throughout the system, a costly venture for the financially-troubled agency. Next time you’re lost on the NYC subway, you won’t have to peer at the map – and over your neighbors’ shoulders – for quite so long. A plainer, train-only version – stripped of neighborhood names, parks, ferries, and bus connections – will simplify scanning the map while riding. The 2010 map also encourages potential passengers to visit the MTA website to find out about planned – and unplanned – service changes, which are especially frequent on the weekends. Rivals to the MTA map include the Kick Map, whose designer, Eddie Jabbour, calls the current map “an artifact of its time” (i.e. 1979.) Reportedly 250,000 iPhone users have downloaded Jabbour’s Kick Map. Websites like Hopstop.com and “augmented reality” mobile phone applications like WayFinder NYC also offer easy-to-follow directions that have made the map all but obsolete for some subway riders. Let us know what you think about the new map. If you’re in NYC, how often do you use the map? And for long-time New Yorkers, how has your usage changed over the years? Talk amongst yourselves. Tags: maps, mass transport, metrorail, MTA, New York City, subway, Washington, D.C.